Kjetil, André and I also did the "Vindelälvsdraget" with Team 13 Hamar TK. We were 7 people in the team, and we won the 320k realy with a very good time. I got a new lap record, and we did very good over all. Fun race for all levels. We were no 4 after the first day. 18 sec. behind Elin Bjørk, 9 sec after M Høgberg and 5 sec after Tsjekkia. Soulier was 1 sec behind me, and Eira Aaseby 3 sec behind me. We were told it should be a pursuit, and was really happy about that. A pursuit would be a second chance for me. I was so exited. But when we entered the parking lot the following day there had been some protests, and we were back to the 1 min intervall. I was not happy ! I had used booties on all my dogs the first day, and that probably slowed them down a bit. I was concerned about André's race later in the week. It was just totally amazing to win the gold medal !!! ,015 sec before the CZE guy. Elin was no 3. André Won the 4-dog junior class: 3 days. 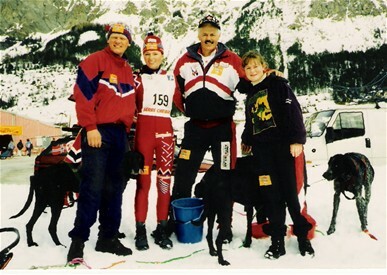 The last day he used only 3 dogs, because the relay was the same day, and I was on the Norwegian Team no 1. Fine Josefine was resting. Andre still won with 1.36 total :-) I was so happy too see him finish !! Trainaux Vallgaude, stagerace in France. Tigerfrøken had a bad injury after the first day, but Lucky stepped in as a great lead dog, and we won the race :-) Pulka, Black, Turbo, Gullet, Lucky and Tigerfrøken was in the pool, and we raced with 4 dogs every lap. 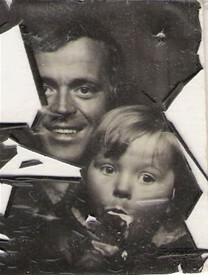 Arne, my dad, was handler. I won the Norwegian Championship in 4-dog sled at Hamar. 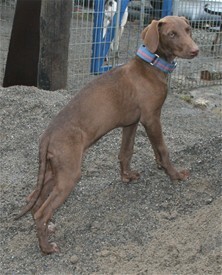 Lucky ran faster than the light the first day, as a lead dog. Really impressing. Snørock was a great ending of the season. André did great in the "up to 16 years class", and got the 4. place with Helle. Julie finished 2. in the senior class, and qualified for the superfinal. She was no. 4 with Fine Josefine. Thomas Northug won, Ole Einar Njørndalen no.2, and Yngve Hoel no. 3. The dryland season was André's season. Pulka had a bad crash with another dog in the dogyard in the summer, Tigerfrøken has still not recovered since January, Turbo had a problem with his foot, Snehvit had her uterus removed, and Gullgutten lives in Oslo. 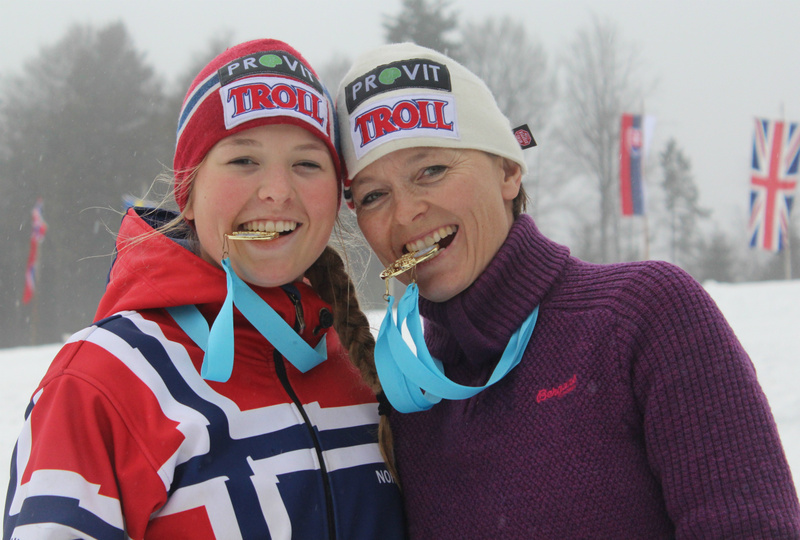 Spinnvill and Fine Josefine was too young for the Norwegian Championship. But André qualified for the European Championship in England with his 2. place with Turbo in scooter. André and Fine Josefine won the scooter junior class in the European Championship in Thetford in England. Great preformance. They had 3. best time of all (incl seniors) the last day, and they qualified for the 1. team for Norway in the relay (seniors) They finished 5. André had 2. best time of all in the second lap. Our plan the whole season was that Julie should start in the World Championships in Todtmoos. 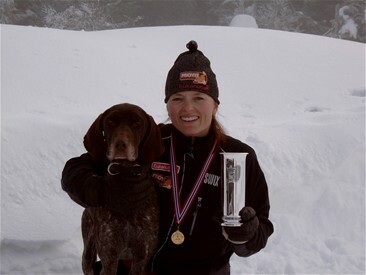 Julie was European Champion in sled junior 2014, and European Champion in scooter 1-dog junior in the fall 2014. World Championship gold medal no. 22 and 23. During the season, I decided to participate in the first part of the World Championships in Bernau. Pulka, Tigerfrøken, Snehvit and Saga (Beatrice M Gatti) and I won the mass start, and the day after i won the relay with the same dogs, and with Yngve and Eskild in the two firs laps with skijoring. Julie came down in the middle of the week (just back from a golf training camp in Spain). It was a great fall season. After a warm summer we had a warm fall too. I trained a lot in quite high temperatures on purpose. I wanted to know how the dogs preformed, and also get used to what we might meet in WCh in Italy. In the 2-dog scooter the next day three were a lot of very good candidates. I was really really happy to end up as no.1., 15 sec. before Carina Nilsen and Trond Are Hoel. It was only 5 sec. between 2. and 7. place. We started after 14.00 in quite hot wether. Pulka and Gullgutten was the heroes, and I won my 25. Norwegian Championship gold medal. The next races we had some trouble. Gullgutten got injured in his back the last day of the Norwegian Championship. Thanks to our vet/chiropractor Ingrid Wiik !! In Italy it was very hot. For the first time there was a relay with: canicross (Jesper), scooter (me) and bikejoring (Svein Ivar Moen). We were very happy to get the third place :-) I used our "new" GSP Tyra, and she was very focused. It was a great season on winter too. 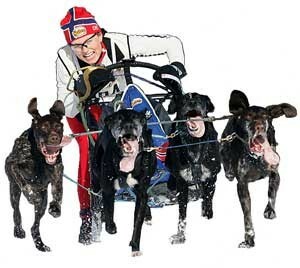 I won the first race at Hamar, in 4-dog sled, with Gullgutten, Pulka, Snehvit and Turboprinsen. The main goal for this season was the Kings Trofé in 4-dog class. The last time I had the opportunity to fight for the Kings Trofé in sled was in 2003 (I won the 6-dog class and the Trofé then). Many pulka mushers also trained for that race, so I was very happy when I was the winner after two days racing at Spidsbergseter. Gullgutten, Pulka, Buff and Turboprinsen ran in my team. Then it was of to the World Championships in North Pole / Fairbanks in Alaska. I brought the same dogs I used in the Kings Trofé. It tured out to be a great championship. Friday and Saturday it was a normal race, with interval start. I was in the lead by 47 sec. after the first day, and there was more after the second day. France at second place and Sweden at third place. The distance was 9,12 km both days. 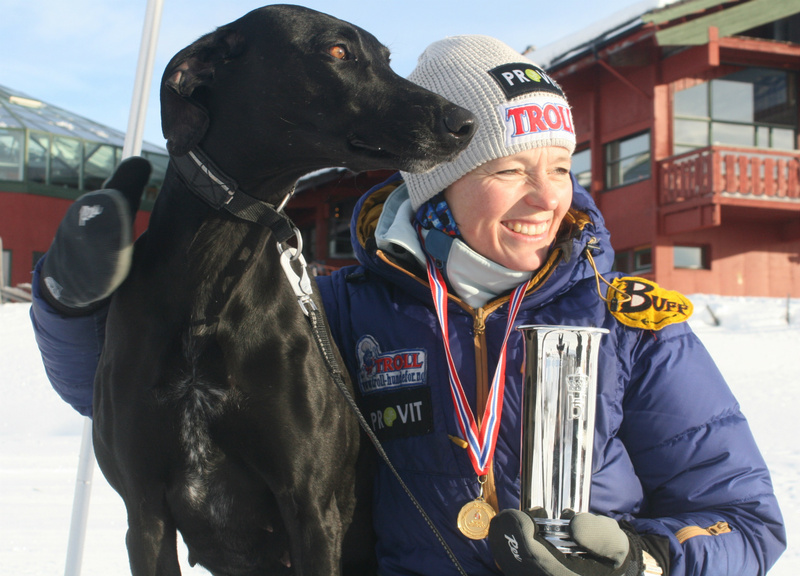 I won The Kings Trofé (Norwegian Championship) and 2 x Gold Medal in the World Championships, all in 4-dog sprint. PS! Lucky was out because of the injury in France last season. Snehvit could have run in Alaska, but I could only bring 4 dogs and I had to make a choice. This was a great season. It started with the Swedish Championship, where I won the 4-dog class, and was second in 2-dog class. It was a difficult and hard trail, but much fun. Pulka and Gullgutten in 2-dog, and Buff, Lucky, Snehvit and Turboprinsen in 4-dog. Then it was Drammen Grand Prix, victory in 2-dog with the same dogs, and Jorbru with same result and same dogs. In the Norwegian Championship I won both 2-dog and 4-dog class. That was great. Buff and Lucky did not run, because of injuries. And later on I was European Champion in 2-dog With Pulka and Gullgutten. I won my 15. European Championship gold medal. And stil very very happy ! And i was second in 4-dog class with Lucky and Buff in front (both 50% Greyhound), Snehvit and Turboprinsen. That was quite great too. Lucky and Buff are on the limit of what they can perform as 50% Greyhounds. The season started well with victory at Hamar Hundekjørerfestival in 4-dog class. In January I went to France and the stage race Defi Rhône Alpes. 9 days and 8 laps. Around 6,5 km. Lucky was injured the second day because of much snow and a bad downhill. We lost a lot of time that day, and was a bit behind the others. Still we won the race 1,38 before Igor Tracz. Quintin Soulier did also participate. We had a great time in 4 different places in the French alpes. Buff did great, together with Gullgutten, Turboprinsen, Snehvit and Provit. Lucky was out for the season . Too bad!!! 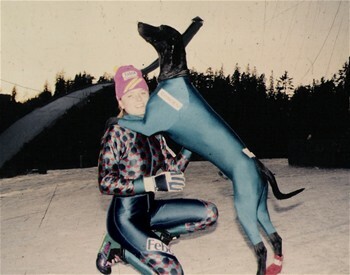 The last race was Vindelälvsdraget, where I was on the winning team: Team Non-Stop Dogwear. I skijored with Gullgutten and Turboprinsen. MUCH FUN race ! I won the Norwegian Championships in 4-dog class. We had big internal "fights" about skijoring in our federation. They decided that we had to qualify for skijoring 2 dogs with pulka 1 dog. This class would have been perfect for me, but NO ENTRY...! Spectators, TV, fun trails and great weather. I could not participate in the Norwegian Championship on snow, because my dogs were "tecnical" still on doping after the problems in Pirena. It was a very hilly trail. Not tecnical, but much fun! It was hard to deside witch dog to use: Frøken Norge or Miss Alaska?? But Frøken was really motivated, and was the lucky one. Domenic from Swiss was no. 2 and Venke de Lange no. 3. In scooter two dogs I was second. It was OK, but Frøken was tired downhill after the two days in the 1 dog class. She has injured one toe, and gravel road is really hard for her (I don't know the english word "forkalkning", but it will not heel) Igor Tracz fom Poland won. Gåsbu/Hamar 2009. Frøken Norge, Miss Alaska, Romeo and Tin. Track record on saturday, and fast times on friday and sunday. It was a great experinece! 14 days with competitions. I particitated in skijoring, with Frøken Norge, Miss Alaska and Romeo. You are only allowed to use 1 or 2 dogs. I used 2 dogs in each stage. It was much heavy snow, and much heavy wether this year. The skijorers went from 11 km to 24 km. I had 2. best time of all, includes sleds, in one 24 km and 12 km. And the beste time of all in a 12 km trail. That was fun! Skijorers and sleds competed in the same trail/distance 5 times. I got tired of not using my own dogs in 4-dog class. Kjetil's dogs have done really good for me, but they miss the extra explosive strenght in the hills and turns. May 17. 2007 Bergans, Buff, Fart, Lucky, Alpina and 4 others were born. Froken Norge and the Swedish Greyhound "Black Warrior" are the parents. 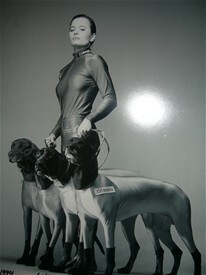 My 4-dog team in Gafsele (Sweden) World Championships 2007. I borrowed two of Kjetil's unlimited dogs. I was far behind the first day (number 4). Froken Norge and Miss Alaska were playing the whole trail. This because we two weeks earlier made the movie "The road to the Olympics", and it was a lot of stop-run-play-stop-play.... 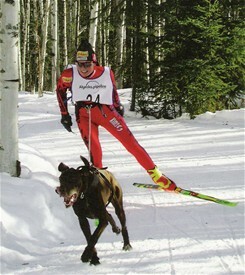 The second and third day I put another dog in lead (Step) with Miss Alaska, and we had the fastes time both days. We ended up with the silver medal. Froken Norge and Miss Alaska were bought as puppies in 2005. I found out that is was difficult to live without the competitions. Ole Brumm and Turbo Junior were getting older... The females were European and World Champions 1,5 years old. The picture is from the WCh. Rastede Germany 2006. They were also World Champions in 2007 in Piandelagotti in Italy. The females are pure Votsthers, and bought because I did not get any puppies my selves. 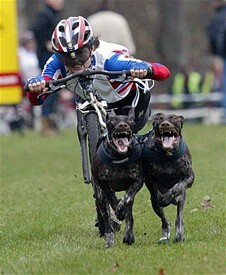 They are running really greate as lead dogs in 4-dog, and offcourse in kickbike 2-dog. 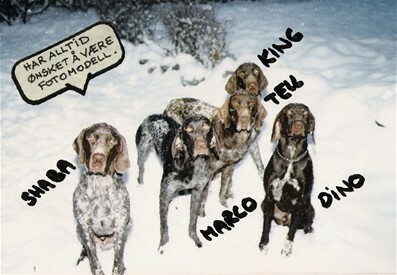 I only had two grown up dogs, so I used Kjetil's unlimited dogs in my 4-dog team off-snow. I did non sled competition after 2003, until 2007. 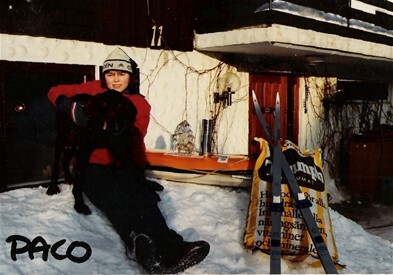 2003 was the last winter-season with my own dogs. I ended my career with European- and World Championship gold in 4-dog class. 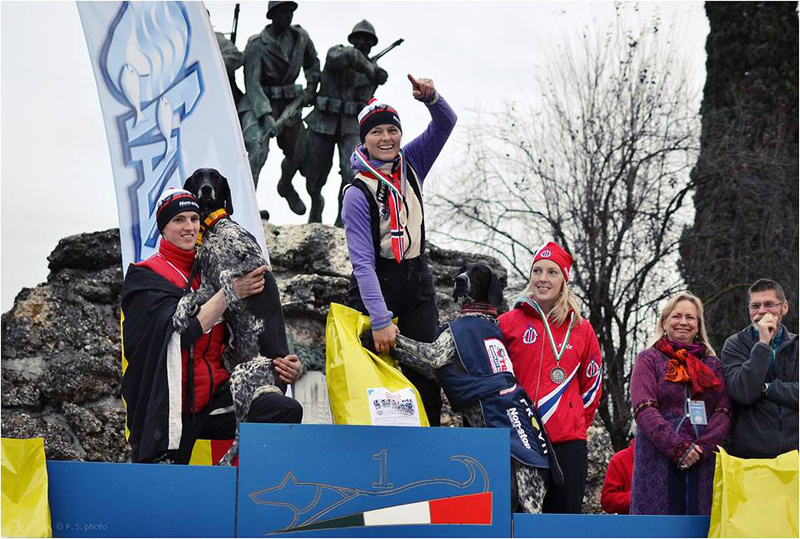 Norwegian Champion in 4-dog, 6-dog KingsCup, pulka 2-dog 15 km, and skijoring. In the KingsCup race i used Ole Brumm, Turbo Junior, Funny, ET, Nikita (Kjetil) and Lob (Kjetil). Picture: Ole Brumm and me. After Turboprinsen, Tigergutt and Cherrie (sister), there was Batgirl, Alaska and Snehvit. They also had great Victories, in all my categories. And after that Ole Brumm and Turbo Junior, grandsons of Turboprinsen. 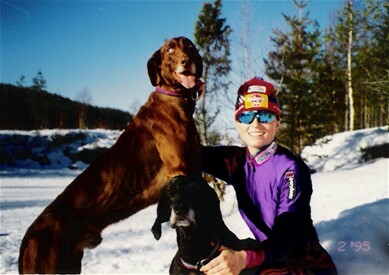 They won the World Champions in St. Moritz 1999 when they were 1,5 years old, as lead dogs in my 4-dog team. They have done great ever after. In 1995 both Kjetil and I won the European Championship in Serre Chevalier in France. Unlimited class and 4-dog class. My father and my handler Kine are also in the picture. I have had some great handlers. Among others I have to mention Eva Thorslund Aadland in addition to Kine Moen Holilokk. They really understood what I was thinking all the time!! In 1994 we had some big newspaper and magazin stories with this picture. The photo sesion was in a fashion magazine studio, and it took houres. The dogs were quite tired of wearing their dresses after. But it was fun! The Greysther was a sucsess! Turboprinsen and I was World Champions in Pulka Class in 1991, Winnipeg, Canada. We got much attention for our results in that period. And also because we did unusual things, like wearing this nice dog-suite. The picture is from Holmenkollen in Oslo. 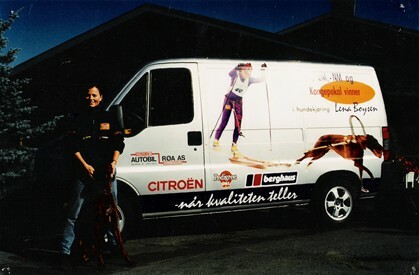 I was working full time at my fathers Citröen-garage from 1988 to about 2002. I had 5-7 dogs inside my office every day. The rest of the 24 houres I was training and sleeping. It was quite serious! Bad Mitterndorf 1992. Some of my faithful supporters: Alvilde Marie Moen, Kine Moen, Leif Moen, Liv Boysen (my mother), Bjoern Faye and Kjell Moen. My father was probably running arownd with me... I have been lucky to have a big team supporting me. Even my grand mother Enny joined me around. We had many great times. A new breeding: "Ben Johnson and Grete Waitz mix"
Turboprinsen (1988) and Tigergutt (1991) was "Greysthers": 25% greyhound and 75% vorsther. They were both great in all disiplines. From the beginning of the '90 I had 7-11 dogs, and mostly Greysthers. Many people thought this mix was no good, because the greyhound would hunt the target and run no more. That did not happend. They ran, and passed other teams like any other Vorsther. I trained them the same way I trained my Vorsthers. 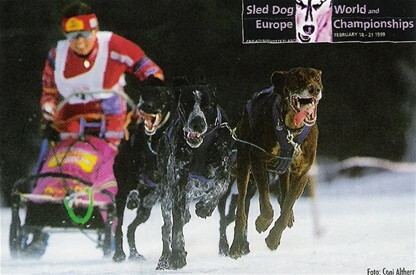 In 1992 i started with sled (3-dog class), in addition to Pulka class. I was searching for more international competition, and new goals. Until 2003 i competed in both classes, and was the first one (and only one!?) 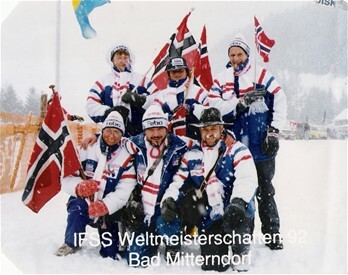 to be World Champion in both sled and pulka in the same championship: St.Moritz 1999. Our first international year was 1988. The picture is from the race "Pulka Blanche" in Alpe d'Huez in France. The dog's name was "Marco". 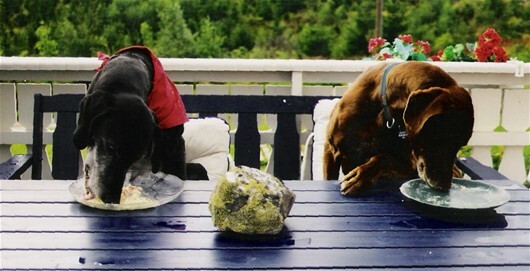 Until 1996 we had to put our dogs in a 4 months quarantine when we returned to Norway. 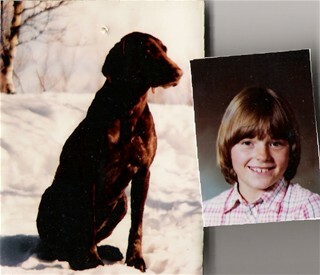 I was in Nittedal Dog Club's relay team in 1982 in the Norwegian Championship (for children) and we won the gold medal. 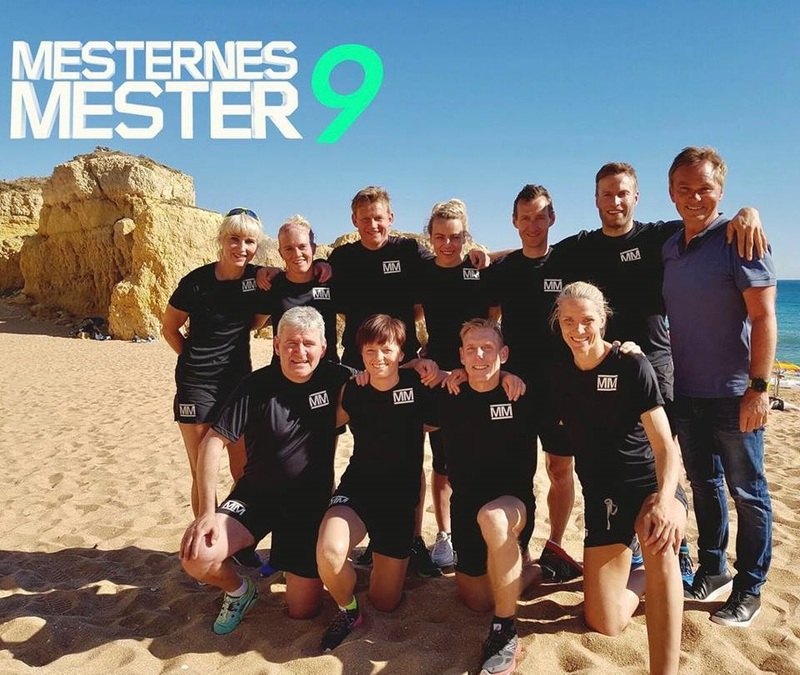 I'm not sure, but I think Anita Halvorsen and Laila Nordby were in my team. My first individual gold medal was in 1983. I used our dog Paco, and I was really proud. My father was a active pulka musher. He was quite good, but the European and World Championships was not inventet at that time. The pulka sport was big in Norway, Sweden and Finland. But because of the quarantine/rabies we did not compete in central Europe before 1988. 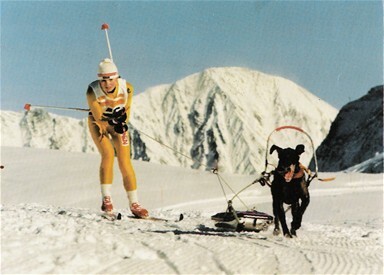 My club Holmenkollen arranged the "Mini-ECh" in 1986, and we got French and German pulka mushers to Norway. They used our Norwegian dogs, had fun and made good contact for the future.